How Much Should Website Design Cost? https://www.searchcontrol.com/wp-content/uploads/2016/02/how-much-should-webdesign-cost.jpg 321 810 search.control.admin /wp-content/uploads/2016/04/logo.png search.control.admin2019-02-01 10:00:092019-02-14 19:57:05How Much Should Website Design Cost? One of the most common questions we get from local business owners is “how can I improve my Google Places rankings?”. Once you have optimized your Place page, it comes down to five things which we explain below. The technology age is a brave new frontier for anyone interested in elevating their unique perspective about, well, just about anything. We all have a digital footprint across the web that has been cultivated and curated by ourselves, friends, family, and coworkers. The question has become not whether or not you have a personal brand, but whether or not you’re choosing to cultivate it. So, if you choose to develop your brand, here are a few ways to get started. 1. Think of yourself as a brand. What do you want people to associate you with? Are you an expert in a particular industry? Identify this area of expertise and begin to voice your opinion, write articles, and share content that is relevant to what you’re passionate about. 2. Get your site set up. Having a personal website is a fundamental way to get yourself seen on searches and move through the search rankings. Don’t stress about it being over-the-top. Start with something basic but informative with clear access to your social networks and body of work. Add to it over time. 3. Google yourself. Knowing who you share a name with, and what’s being said about you (or someone with your name) is an important part of cleaning up your brand. Carve out your space by using your middle name or initial, especially if your name is a common one (hello, John Smith). Keep tabs on what’s being said about you with alerts too. 4. Be authentic. This ties back to the first point. As you build your brand, it should be a reflection of who you are and what you’re about. People want to feel like they’re connecting with other REAL people. Assess and develop your true self, people who like what they see will want want to engage and stick around. 5. Act purposefully. Every speaking engagement, article written, tweet sent, and Instagram posted has an impact on your brand. Once you’re clear on what you’re about, strategically manage what you’re sharing to nurture it in the direction you desire. 6. Leave room for growth and change. Some of the people with the best personal brands are on their second and third acts: think Martha Stewart, Richard Branson, Mark Cuban. They haven’t left their original passions behind, but they have created avenues to share their other interests while remaining true to their original narrative. No one remains static on their thoughts and interests, allow your brand to be ever evolving as you will be too. In the years since its inception, Google’s growth from simple search engine to provider of multiple web services has seen it release a number of tools and programs for both users and webmasters to take advantage of. Some, like AdWords and Gmail, are well-known by name; others fly under the radar and take a little more digging to discover. One example of these lesser-known programs is the Google Grants program. Although the criteria for this are rather specific, it is set up just like an AdWords campaign – albeit with some limitations. If you’re familiar with AdWords and are eligible for the Google Grants program, this may be perfect for bringing your non-profit business the online boost it needs. This article consists of two parts. The first half will give some background on what the Google Grants program is, who is eligible for it, how you can apply if you meet the criteria and certain limitations advertisers face. The second half will outline a real-world case study, showcasing how an agency using the Google Grants program worked to improve the position and click-through rate of their campaign. Part One: What is the Google Grants Program? 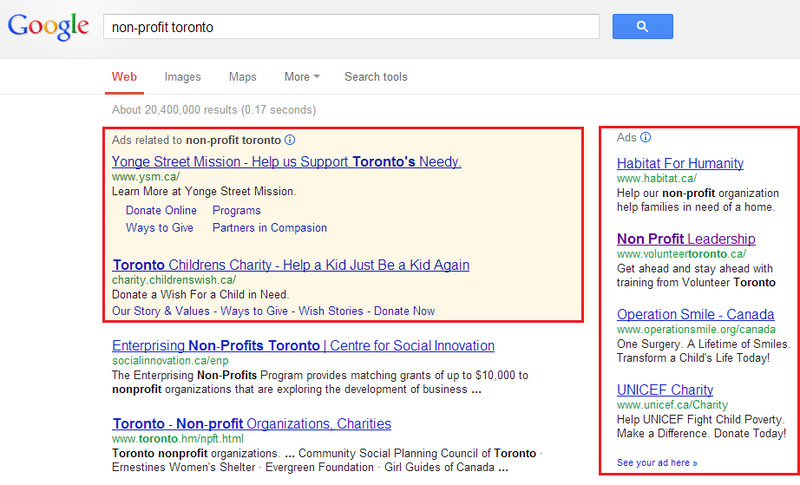 So, in short, Google Grants is “AdWords for Non-Profits”. If you’re running a company that meets Google’s criteria for this, the Google Grants program gives you a helping hand with promoting your products and services. Businesses that are eligible and participate in this program receive a $10,000 monthly grant for their campaign. There are several criteria that a business must meet in order to be eligible for the Google Grants program. They must hold 501(c)(3) status, as determined by the U.S. Internal Revenue Service, and must acknowledge and agree to the application’s required certifications regarding non-discrimination and donation receipt and use. The program is only available to companies in the countries listed here, and governmental entities and organizations, hospitals and health care organizations, and schools, childcare centers, academic institutions and universities (with the exception of philanthropic arms of educational organizations) are not eligible. There are some restrictions to using the Google Grants program. Daily budgets are set to $330.00 USD, Costs-Per-Click are limited to $2.00, campaigns can only be keyword-targeted and ads can only be text ads. The full list of restrictions and limitations can be viewed here. Ads can only be shown on the Google Search Network, not the Display Network or on Search partners. Campaigns can only be keyword-targeted and cannot use CPM bidding. More information on limits to where ads show is available here. The maximum daily budget you can set is $330 U.S. dollars, which is equivalent to about $10,000 per month. Within the last year, Google has increased the Cost per Click bid for keywords to $2.00 USD from the original $1.00 bid per keyword. Accounts can only use Manual bidding for clicks; automatic bidding is not allowed. You are unable to set Display Network bids or managed placement bids. More information on limits to budgets and bids is available here. It is important to note that Grant accounts will only run for as long as your organization remains actively engaged with your AdWords account. Google states that they reserve the right to terminate your organization’s participation in the Google Grants program for any reason without notice at any time. We recommend to any Grant Account Managers to consistently check in on the AdWords campaign at least once a month to keep the campaign active and to check for any urgent notices from Google or changes to the Grants program. Why spend so much time getting the Grant approved and then waste it away on inactivity? Getting accepted in Google’s Grant Campaigns is an extensive process, but the benefits of the program are limitless. Do not take the campaign for granted and be sure to check in on the campaign multiple times each month to be on the safe side and it’s also a great practice to follow for any AdWords campaign.